TED, Other Effect Plug-in from K Devices. 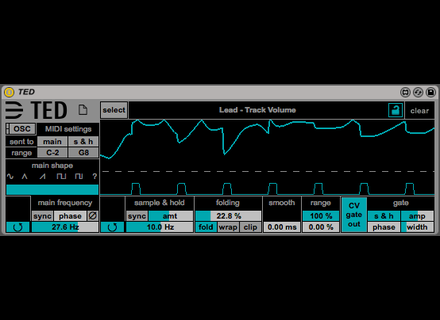 K-Devices introduces TED, a new Max for Live device that allows for modulating almost anything in Ableton Live. TED features three main sections: Main oscillator with 6 morphable waveforms (sine, triangle, sawtooth, pulse 50/50%, pulse 90/10% and random), a Sample & Hold circuit with amount control and an effect section comprising a Wave-Folding effect that can act as a wave-folder, a wave-wrapper or a wave-clipper, a Smoothing effect and an adjustable output. Thanks to these features, you can modulate in Live all the parameters from other devices, third-party plug-ins and event the DAW UI. The device also includes a CV/Gate output for your compatible hardware instruments and modules (a DC coupled audio interface or D/A converter is required) and it is OSC compatible, a template for the Lemur iOS app is also available. TED can be purchased at k-devices.com for 5€. Prodyon offers instruments from Shortnoise 2 Prodyon is promoting the upcoming Shortnoise 2 library for Kontakt by offering free instruments everyday. End of Summer sale at SoundToys During the last days of Summer, SoundToys lowers the price of a selection of its plug-ins. A free hybrid synth for electronic metal sounds UK sound library and VST developer Hinton & Fairchild offers the free FMetal VST 32-bit synth for Windows.